The historical great hall of the Charles University Prague, CR established by the Emperor Karel IVth (his sculpture at middle left) as the earliest university in Central Europe in 1348. 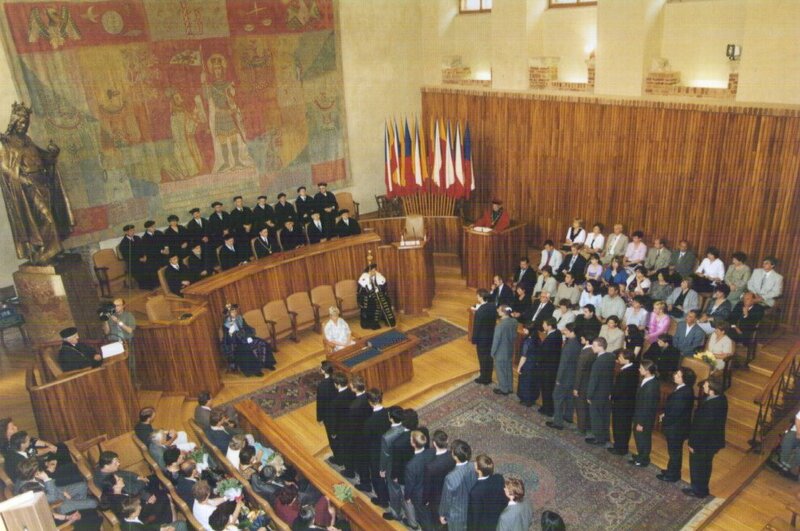 The emblem of the University seal represented in the center of the tapestry on the front wall: Karel kneeling to St.Vaclav the patron of Bohemia. Below are given introductory remarks of Dr.Vyborny at a medical conference held in 1995 at the principal medical facility of Charles University in Prague. He refers to Dr. Maryellen Giger, his colleague at the University of Chicago. Other individuals invited to Prague for the occasion were Dr. Carl D'Orsi, Mr. Arthur Haus and Ms Rita Heinlein. President Vyhnanek, Dr. Danes and members of the Czech Radiological Society, I thought I would start, as a way of introduction, with a short description of my background and my experiences since they might be of some interest to you, not because they are remarkable in any way, but because they are very typical and very representative. My experiences are also similar to those of my friend and colleague, Maryellen Giger, whose maiden name is Lissak, and who is entirely of Slovak ancestry. In many ways her background is like that of my own and those of other second generation Czechs in America. Maryellen and I are from Chicago and Chicago, of course, is one of the great cities of the world. It is the largest metropolis in the interior of the continent (image1) and is thought by many to be the most American of all the great cities of the United States. Approximately eight million people live in the metropolitan area that stretches over three states along the shores of Lake Michigan (image2). Of these, no fewer than one half million individuals have at least partial Czech ancestry. It is not hard to find evidence of this in the many neighborhoods of Chicago and the surrounding suburbs. Monuments also exist, for example, a statue of the patriot, Karel Havlicek, (image3) stands near Lake Michigan next to the Planetarium and overlooks the skyline of Chicago (image4). More familiar to me are those seen along the Midway of the University of Chicago. To the East of the Medical Center where Maryellen and I trained is Rockefeller Chapel (image5). The highest of the three figures to the left of the large stained glass window at the front of the chapel is that of Jan Hus (image6). And further to the East, at the end of the Midway (image7), stands a statue representation of the Blanik Knight (image8), a symbol of the courage and fortitude of the Czech people placed there to commemorate President Masaryk who once taught at the University but also, we hope, placed as a testament to the many contributions that Czechs have made to the city of Chicago. The Czechs in Chicago have mainly lived in a corridor to the west and south of the city's heart. At the eastern end of the corridor is the Pilsen neighborhood of Chicago where many Czechs first settled and that, in keeping with the cycles of American life, is now the home of newer immigrants, largely Hispanic in origin. A view from the world's tallest building shows the church of St. Procopius in the Pilsen neighborhood in the distance (image9), beyond the University of Illinois. At the far western end of the corridor is the college, once also named for St. Procopius (image10), that Maryellen attended; established and run by Czech Benedictines (image11). At the center of the corridor is the area with which I am most familiar including the suburbs of Cicero and Berwyn, Illinois. If you have relatives in America it is likely that some of them may have lived here or nearby, possibly along Cermak Road named for the Czech mayor of Chicago who died in an assassination attempt on President Roosevelt. I have already apologized for not speaking Czech, and it is true, but I still remember its sounds and rhythms well in memories of my kindly grandparents who lived along Cermak Road and who spoke Czech as a first language for all of their lives despite having come to America when they were small children. And when I was young, Czech was the language of choice all along the street and in the surrounding neighborhoods. The Czechs, of course, were very successful here and are now much more dispersed throughout the suburbs of Chicago. Nevertheless there are still many remnants of the old neighborhood even today seen here in shops (image12) and bakeries (image13) and restaurants (image14,15), and in 1989 portraits of President Havel appeared in the windows and storefronts all along Cermak Road. But I should say to you at least once that the good things you have heard about America are true and that the children and grandchildren of the Czech speaking immigrants who lived along Cermak Road and elsewhere have not been judged by the sound of their names or by the circumstances of their birth, but rather by their willingness to work long and hard and to do the best that they could do. Many pursued medical careers and some became radiologists and this leads me to the main topic of my talk today.